Download a Lake Walker COP registration sheet here. Lake Walker and Evesham Park residents joined together, with support from the Northern District of the Baltimore Police force, to create a Citizens on Patrol program. Participants wear orange vests (patrolling pooches wear orange bandanas). We hold quarterly walk events. Encourage neighbors to remove valuables from inside of their cars. Be smart about reporting activity: discreetly take notes (written, mental) of what you saw and where, then wait until you are at a safe distance to report it. Document the time and details of your call. If you open windows in your home, make sure they are closed and locked before you leave the house. If you have a garage or a shed, make sure that it is locked securely. If you have an alarm system-use it! Make sure that you do not leave ANYTHING of value in your car (electronics, CDs, etc.). Let a neighbor know when you are going on vacation so that they can keep an eye out for anything suspicious. 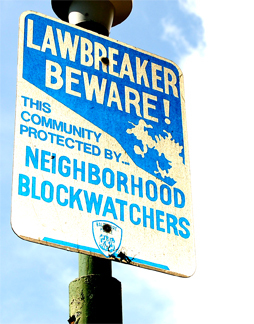 A Crime Watch number, also known as a “Block Watch” number, is a unique, seven-digit number issued to you by the Baltimore Police Department. It allows you to anonymous report suspicious activity. If you use the number when you call 911, the operator will not ask for your name, address, etc. and the responding officers will not contact you to follow-up. A Crime Watch number can also be used when reporting non-criminal, non-urgent issues to 311.